This advice is written for those of you who plan on opening a paragliding business. Read these tips before you start! Thinking about opening a paragliding business? We tell you what you need to know to get started. Paragliding has gained popularity as both a hobby activity and a competitive sport. To accommodate demand for paragliding experiences and instruction, paragliding schools and business have emerged, giving enthusiasts a safe and satisfying way to enjoy the sport. The typical paragliding customer has limited or no prior paragliding experience. They come from all walks of life, but are generally people who are willing to embrace a certain amount of risk in life. Based on their initial experiences with your business, they will make about whether or not paragliding is worth pursuing as a long-term interest. 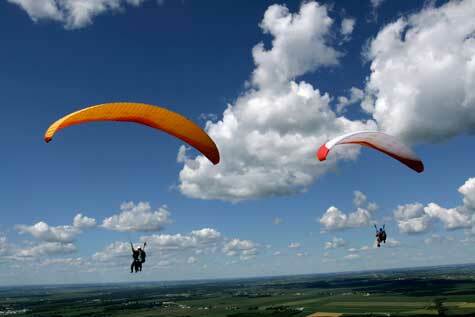 It's important to note that nearly all first-time customers will lack paragliding equipment. If you play your cards right and deliver an unforgettable customer experience, your ability to profit from the sale of new and/or used paragliding equipment will increase dramatically. Obviously, paragliding entrepreneurs should be experienced paragliders. Since your customers will literally trust you with their lives, it's imperative to delay the launch of your paragliding startup until you have gained enough experience to safely instruct new recruits through both solo and tandem paragliding experiences. From a capital perspective, you will need enough startup funding to cover the purchase of a fleet of instructional paragliding units, safety equipment and retail paragliding inventory. Given the fact that paragliders usually run in the neighborhood of $2,000 +/-, it's not unreasonable to assume that you will need at least $50k to get started. You will also need to budget for marketing, staffing, insurance and other typical startup costs -- all of which can add up to a sizeable chunk of change right out of the gate. Paragliding is an inherently risky activity. Despite your best efforts, accidents can and do happen. To protect your business and your personal assets, you will need to implement risk management measures in your startup. A robust liability insurance policy is a no-brainer for a paragliding business. However, you will also need to make sure your instructors have been certified by organizations like the U.S. Hang Gliding & Paragliding Association (USHPA), and that uniform safety procedures are meticulously followed throughout your organization. A carefully crafted business is your paragliding business's most important asset. With the right ingredients, your paragliding company's business plan will serve as a blueprint for success. As the primary stakeholder in your paragliding business, you will intentionally need to insert yourself in various stages of the plan's development. Prior to launching a paragliding business within your community, it's a smart move to see how strong the competition is. Use the link below to generate a list of competitors nearby. Just enter your city, state and zip code to get a list of paragliding businesses in your community. After you've evaluated your local competitors, it's a wise move to learn from folks who are already in business. If you think owners of nearby paragliding businesses will give you advice, think again. Why would they want to educate a future competitor? However, an entrepreneur who owns a paragliding business in a location that is not competitive to you may be more than happy to give you a few tips, as long as they don't view you as a competitive threat. Indeed, many experienced entrepreneurs enjoy offering advice to startup entrepreneurs. If you are persistent, you can find a business mentor who is willing to help you out. How does one go about finding a paragliding business owner in another city who you can speak with? Is It Easier to Buy an Existing Paragliding Business? Competition is tight these days and entrepreneurs can't afford to make many mistakes. So it's critical to get it right when deciding whether to start a business from scratch or buy an existing paragliding business. In general, purchased paragliding businesses fare better than startups, at least during the initial few years. When you buy an established paragliding business, you gain access to a functional business operation with a customer base and a steady revenue stream. Entrepreneurs who are committed to a highly unique value proposition may need to pursue a startup approach. However, in today's business-for-sale marketplace, there is an abundance of paragliding businesses worth considering. The chances of thriving in your new business are much better when you choose to franchise instead of doing it all on your own. Before you get too far along in your plan to open a paragliding business, a smart move is to determine whether purchasing a franchise might be worth investigating. What haven't we covered regarding starting a paragliding business? Please add a comment below. Are You Already a Paragliding Business Owner? Are You Selling to Paragliding Businesses?